Baer Facts - Are You Making Marketing's Biggest Mistake? Baer Facts – Are You Making Marketing’s Biggest Mistake? This special edition of The Baer Facts with my friends from ExactTarget features me urging caution to all marketers, live at the Convince & Convert company retreat in Puerto Vallarta, Mexico. (eat-your-heart-out photo of our secret lair on Instagram). 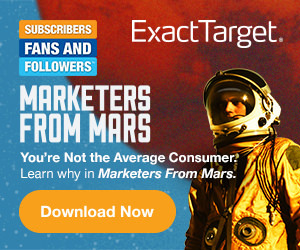 I based this video on new research from ExactTarget called Marketers from Mars (infographic summary below, and you can download the whole report for free here). The study found big differences between how marketers (that’s you and me) use social media, compared to how real people (your customers) use social media. For example, 61% of marketers follow at least one brand on Twitter, so of course we assume that’s the norm. But yet only 12% of non-marketers follow brands on Twitter. That’s a massive difference, and it causes us all to fall into the most dangerous trap in marketing, and make the biggest mistake in marketing….believing that our needs, wants and behaviors are similar to our customers’.